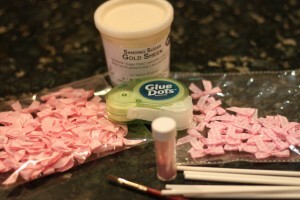 For this post I wanted to put together something super cute that could be done by anyone, even as a last minute order. 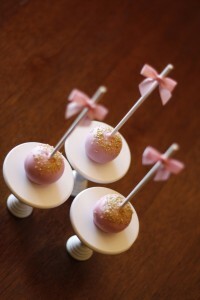 This was for a 1st birthday but could easily be for a baby shower, or to dress up any events’ dessert table really! So here we go! 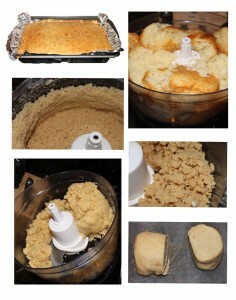 Once your cake is kneaded down into dough it is time to roll some cake balls!! You can do this part by hand, with a scoop, or our favorite way… in the Easy Roller or Mini Easy Roller! 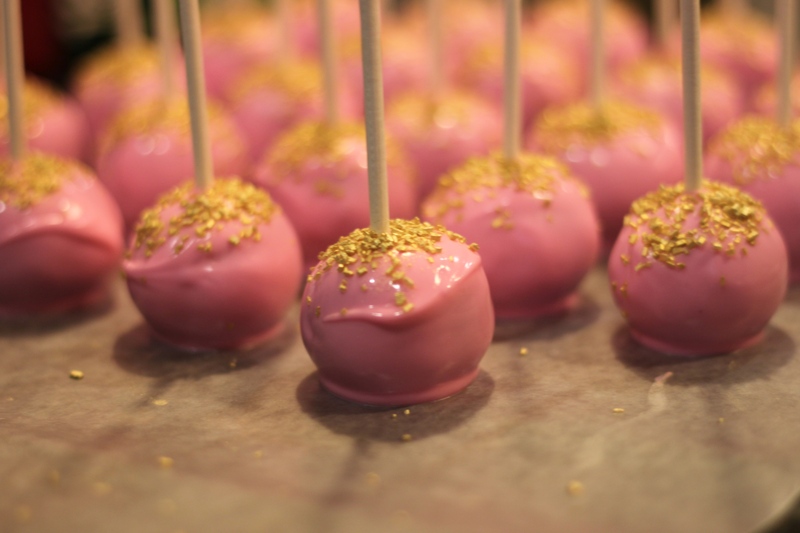 If you make a lot of cake pops, the Easy Roller is the best choice. It can roll 21 balls at once! 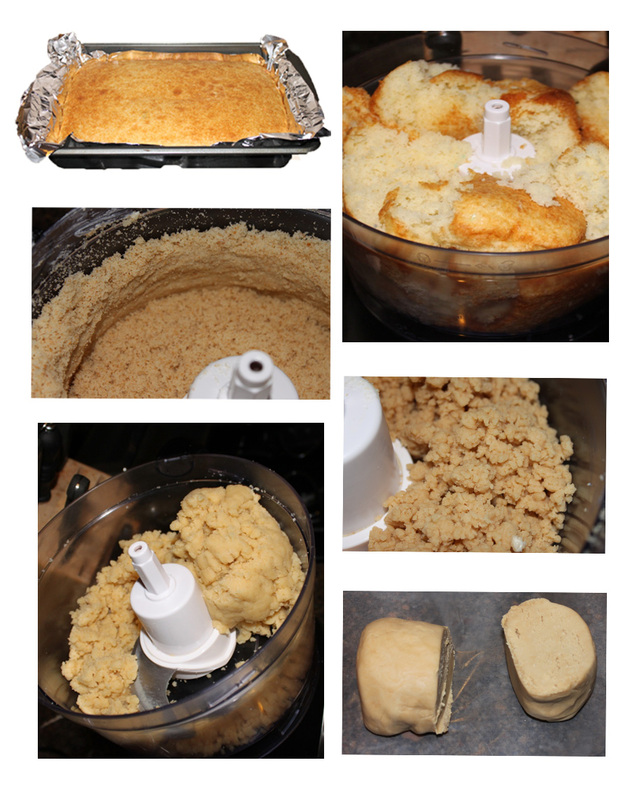 If you make them a couple times a year, the Mini will be the most efficient for you, rolling 9 at a time, or a whole cake in just a few minutes! Right now the “Mini” is on Pre-Sale for just $29.99 so check it out, it is much better than by hand;)! Once all your cake balls are rolled up it is time to dip them in the candy melts! You can get pre colored candy disks and melt them down at 1/2 power in the microwave stirring every 45 seconds or you can buy almond bark and color it with candy colors (oil based) and heat them the same way! They both work great! Now that your candy melts/almond bark is melted, dip your cake pop stick into the melts and then into the cake ball. 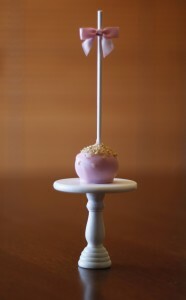 This will help better adhere the cake ball to the stick! then you can dunk the entire pop into the melts and tap off the excess. 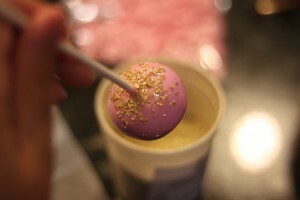 Before it sets, sprinkle a few of the gold sprinkles on to the top of the cake pop. 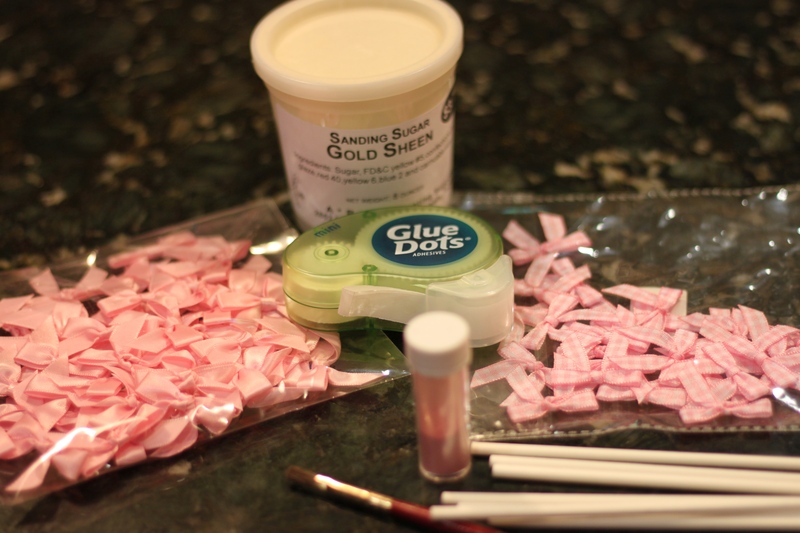 Set them on waxed paper to dry. Now, one last step to add just a little more cuteness! Take the glue dots and place a dot on the back of the tiny bow and then onto the top of the cakepop stick. Voila!